The bar and restaurant community in NYC is pretty tight. 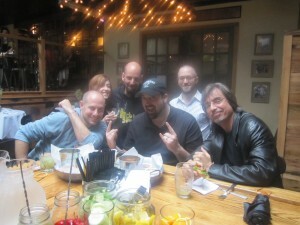 Much like any other industry, there is a lot of networking amongst the owners and employees. We all win together when we can create a better neighborhood experience. When Jeremy Bridgman, one of our regulars at Idle Hands, announced his new bar & restaurant, the Two Door Tavern was opening in Williamsburg, Brooklyn, Marc and I made a note to head across the water and check it out. When the rain started in during the Big Apple BBQ Block Party, we hopped the L train and made our way out to hipsterville. Amongst the beards, tight jeans and interesting outfits you’ll find in the uber-hip part of Brooklyn known as Williamsburg, you’ll also find equally un-assuming Two Door Tavern. A significant portion of their build out was done using re-sourced materials from an old farmhouse, an artillery base and even the George Washington Bridge. 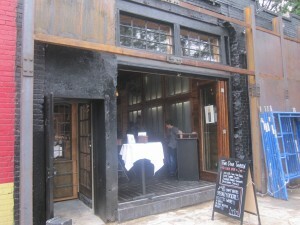 This slightly rustic and relaxed tavern, complete with working fireplace, offers up a selection of mixed cocktails, 40+ craft beers and a menu filled with feel good foods done in a modern and interesting way as well as a very affordable weekend brunch menu. 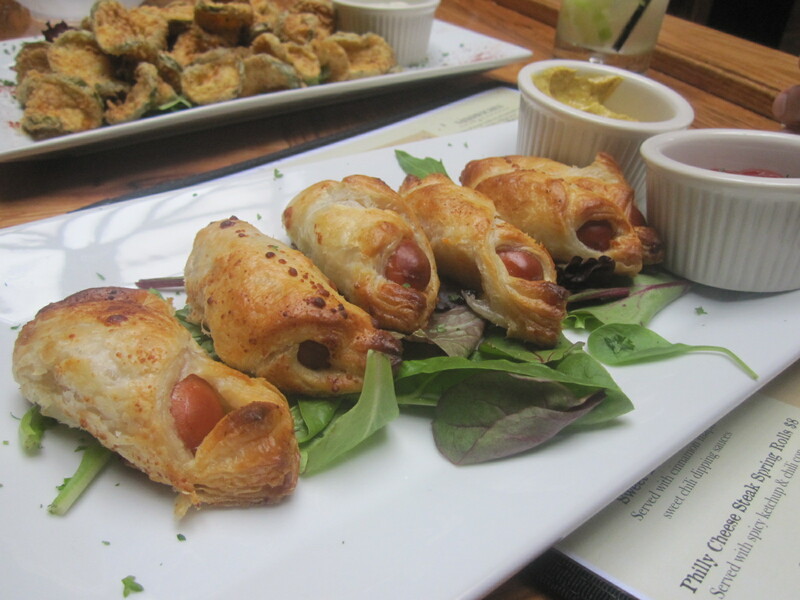 With all the yummy sounding eats like Cheesesteak Spring Rolls, Homemade Pigs In A Blanket, “Brooklyn” Rigatoni, Tuscan Grilled Cheese & Strawberry Fields salad, you’ll find yourself having a hard time deciding what to order. To solve this problem, I suggest taking a couple of friends with you, ordering a number of items and create your own tasting menu! When I asked Jeremy what were the house specialties, he practically read us the whole menu! A few key words sung clear into my ears based on the Captain Lawrence Liquid Gold, a Belgian Style Pale Ale that I had planned on drinking as a pairing. – Southern Fried Dill Pickle Chips – Served with Avocado Ranch dipping Sauce. – Homemade Pigs in a Blanket – Mini Beef and Chicken Sausages in Puff Pastry Crescent Rolls with Brown Mustard and Spicy Ketchup. – Two Door Macaroni & Cheese – Our signature Three Cheese recipe with Crisp Parmesan Cracker Topping. I find Pickles to be disgusting so I didn’t try any. However, everyone else seemed to agree that they were great. The Homemade Pigs in a Blanket on the other hand, I couldn’t wait to try. The light and airy puff Pastry delicately cradled a Hot Dog-esque fresh sausage that was only made better with a light ride in the Brown Mustard (Ketchup be damned!). 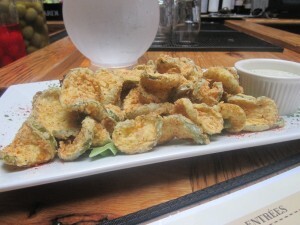 These were so good that they have made it impossible for me to enjoy anyone else’s version of the same dish. 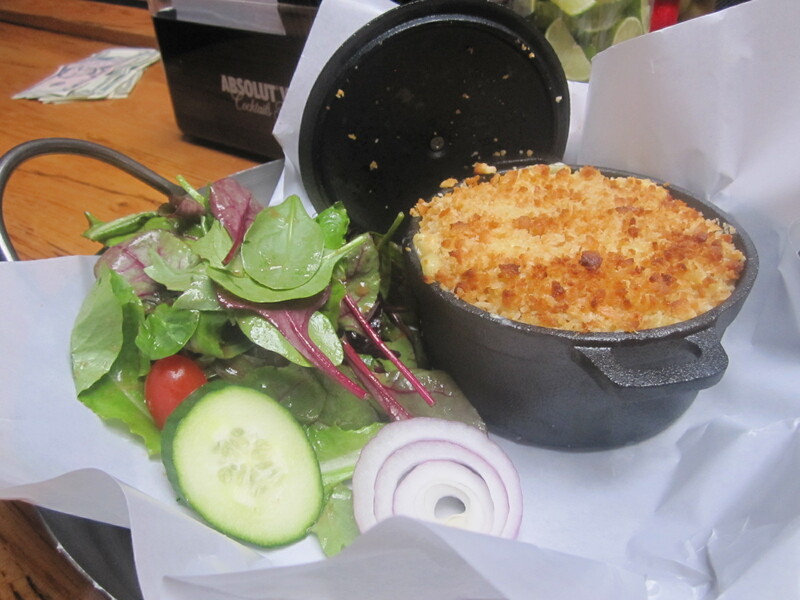 The Macaroni & Cheese, a dish that is usually quite heavy, was actually, by comparison, was light and mild. Bonus points for being made with Shell Pasta, crock pot cooked dish is a great sharable item from the menu. 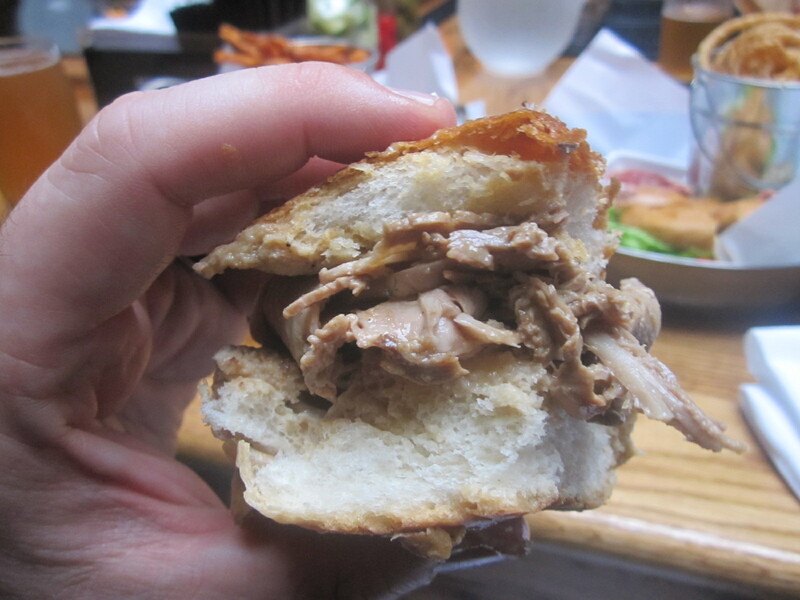 Jeremy wasn’t about to let me get by without order a Burger, but based on his heavy recommendation and amazing description of The Two Door Tavern’s Roast Beef on Weck, it was obvious that we had to split one. “Our House Specialty! Slow-roasted Roast Beef on a homemade Kummelweck roll. 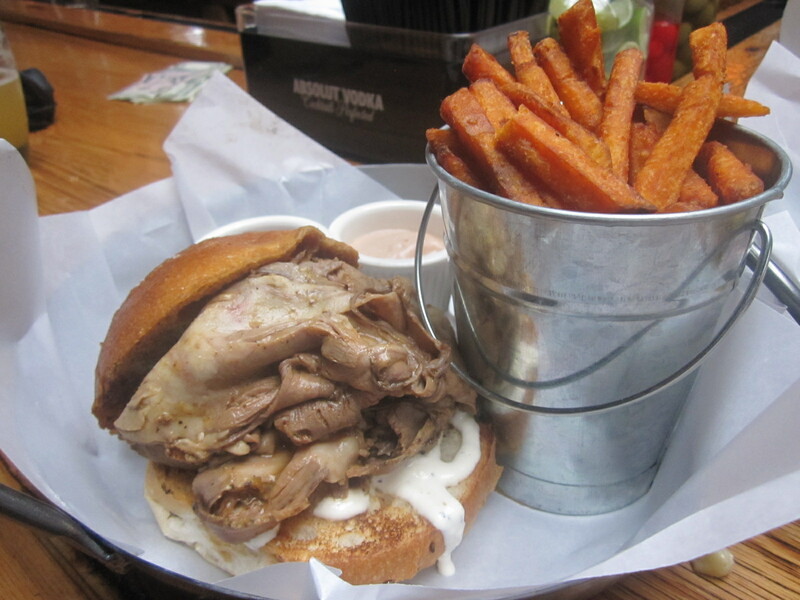 Topped with natural Au Jus & Horseradish Sauce.” This juicy and freshly made sandwich is without a doubt is going to become a neighborhood favorite that will drive people into the restaurant. There’s no way this juicy and just short of being messy Sandwich could be served on a Roll that was less sturdy then a Weck. But not only does it have a functional service to uphold it also tastes great especially with the cracked Sea Salt on top. At the Two Door Tavern, the respect for the Burger is so high that the Sandwich has its own category on the menu rather than just becoming line items in a list of other offerings. The top listed Burger, and the one Jeremy suggests the most is the Uptown Bourbon BBQ Burger, Sautéed Onions and Peppers, Bourbon BBQ Sauce & melted Cheddar Cheeses. You could pretty much use the word “Bourbon” in the recipe of any food item and I would be interested in tasting it. Before even taking a bite, I knew the Chef really cared about their Burgers. 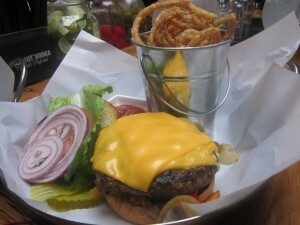 The giveaway, toppings on both sides of the Burger. 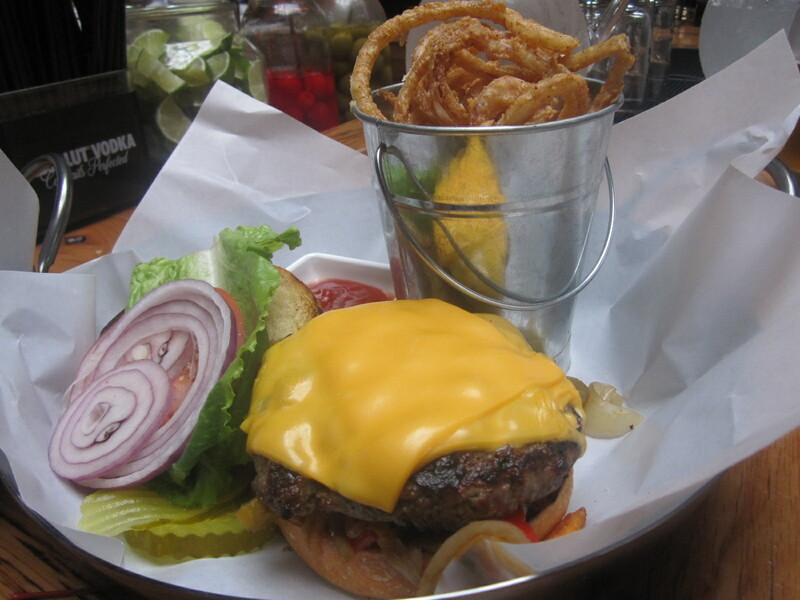 Allow me to confirm, this is one great Burger, carefully designed for maximum appreciation. The patty is made every day from fresh Ground Beef before making it’s way into a complete Burger from. The hearty Burger has a backyard grill taste with a nice salt and pepper crust. Even the Cheese, Lettuce, Peppers and Onions are fresh and tasty. The sauce, well let’s just say that I’d love to taste this as a dip for some Chicken Fingers because it’s tangy and nice. The food at the Two Door Tavern, specifically the Uptown Bourbon BBQ Burger is worth traveling across a river (or two) to eat! Two Door Tavern scores a 2 on The Rev Meter. 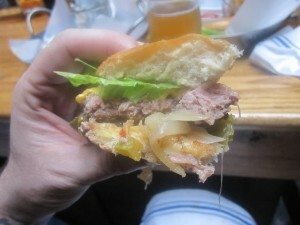 This entry was posted in Bar, Beer, Burgers, Gourmet Burgers, Hamburgers, New York and tagged brooklyn, burger, cheese, ciancio, conquest, french, fries, great, hamburger, new york, ny, nyc, rev, review, the, the rev meter for social community, two door tavern, williamsburg. Bookmark the permalink. The REV meter is incorrect. They do have an active Facebook account and page. They have also been listed on Yelp with reviews.